The latest Datapath Fx4 video wall controllers are driving two new video walls located at Le Rendez-Vous Toyota, the car giant’s European brand flagship showroom on the illustrious Champs-Élysées in Paris. Offering 4K resolution at 60 fps, the FX4 controllers were chosen in order to optimise the solution and attain the best possible image quality. Residing on one of the world’s most famous avenues, Le Rendez-Vous Toyota presents over 1 million visitors a year with unique opportunity to discover the Japanese carmaker’s extensive range of brands for the European market. Those calling by the showroom are immersed in a wealth of interactive Toyota experiences built around the company’s core values of design, quality and innovation. This visitor experience has now been enhanced further with the introduction of two new video walls. The company appointed Philbox, a specialist in LED walls, video walls and digital signage since 1999, to project manage the installation. Philbox is also a distributor of Datapath products in France and opted to use Fx4 controllers due to the image quality that could be achieved. 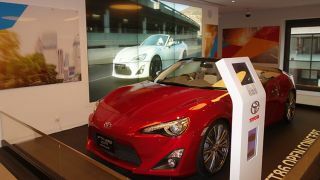 Toyota’s four-screen video wall comprises DynaScan DS55LX4 55-inch narrow bezel monitors, which is being driven by a single Fx4 on the ground floor, while a nine-screen video wall featuring the same type of monitor is being driven by three Datapath Fx4 controllers on the first floor. Content for each wall is provided by a Philbox video player, developed in collaboration with the Visiosense Company. The latest-generation Datapath Fx4 multi-display controller offers four outputs from a single box, leading to a myriad of possibilities for end users. It is capable of source capture at up to 4k at 60 fps or UHD 2160p at 30 fps. Furthermore, the device provides flexible connectivity through a choice of DisplayPort or HDMI inputs, supports HDCP content on all inputs and outputs, and can be programmed and controlled independently of the platform through its network interface options. Developed for true stand-alone operation, the Fx4 can adapt to input changes by automatically adjusting all scale factors. Importantly, with its high bandwidth DisplayPort1.2 loop-through, the device can be daisy-chained to build large scale video walls if required. With dual Ethernet port capability, only one Fx4 in the chain requires connection to the physical LAN as Ethernet loop-through is supported on the second port, meaning multiple devices can be connected. This great news for Le Rendez-Vous Toyota as the new video walls serve many purposes. Primarily, the walls play exclusive previews of newly released or forthcoming models, as well as future concept cars or iconic motorsport models. However, it is also possible to control a cable TV tuner that remotely switches the input of the Fx4 units to the TV box input. This allows the showroom to stream any live motorsport events that involve Toyota. There is also a third HMDI input by the main screen so that guest speakers can connect their content directly to the main wall’s Fx4 controllers, which automatically switch to this source.